Isn’t $30 a safer choice when buying earbuds? They’re technically cheap and you won’t even mind if one of them breaks down or get lost. Even some of them offer decent sound quality that is way beyond their price. This is the reason why I’ve created this list post about 5 Best Earbuds under $30. ...then $30 is the optimum price you can shell for a cheap in ear monitors. Hence without wasting much time... here’s an handpicked list of Best Earbuds under $30 Dollars for people on a budget. However, before we get to it... let me tell you some things to keep in mind before choosing cheap in ear monitors. Personally I’m not a fan of mainstream audio brands like Sony, JBL or Skullcandy... as I believe their products are overpriced and don’t offer optimum sound quality for the money they ask. However we still have the Sony’s MDR XB50AP headset in our list of Best Earbuds under $30 because there are certain type of people who need bass heavy cheap in ear monitors and this model here will definitely satisfy their needs. 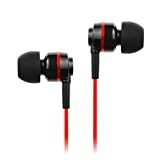 If you want accurate sound earbuds, then ignore this and move forward... well but if you do want cheap but good headphones that give you sound quality similar to Beats earbuds then read on. Sony MDR XB50AP package comes with 3 extra pair of eartips along with a draw string carrying pouch. Coming to the headset, you have an inline microphone with only one button to Play/Pause track and receive/end call... no volume buttons whatsoever. Even the wires are flat and tangle free allowing to not waste your time on removing earbud knots. The earplugs are huge in size, bulky and have angled design that prevents the earplugs from going deeper into your ears and gives an optimum fit when used with proper eartip size. "If you listen to bass heavy genre songs, I’d definitely recommend you going with the Sony MDR XB50AP as I believe they are the best earbuds under $30 when it comes to being bass heavy cheap in ear monitors." If you want a low priced and ultimate value best earbuds under $30, then this is it. Should I say, if you want cheap but good earbuds under $10, then JVC Marshmallow should be your ideal choice... as they sound that good. I'm surprised to see the kind of sound these small cans were able to offer for the price they sit at. I’m amazed to see how such small earbuds feature 11mm drivers that are able to provide great sound quality along with producing wide frequency of sound. They definitely have most balanced sound in their price range allowing you to enjoy all kinds of genres from Bass, Rock, Hip Hop, Jazz and everything in between. I do understand the design looks boring and not inspiring you to get one. However if you only care about good sound quality from such cheap in ear monitors... then you should definitely give them a try as they’re priced so cheap. They’re also available in different colors: Black, White, Pink, Purple, Green and Blue. There’s also another version available with an inline microphone for people who wants to do talking on the go. "Price wise, they are the cheapest earbud in our list and I’m very proud to include them compared to other costly counterparts. If you want to gift this to your kid or just use it with your music player... look no further than JVC Marshmallows." If you’re a regular reader at this site, you must have noticed I’ve mentioned products from Avantree brand quite a few times. Just like Monoprice, Avantree is a low-cost but reliable audio brand that offers products at dirt-cheap price. This dual driver earbud from Avantree is no exception either. Though it has an orthodox design, it offers dual drivers with one driver responsible for handling low frequencies i.e. bass and other driver to handle the high frequencies i.e. treble. This feature thus helps in offering best of both worlds, as you get a thumpier and deep bass as well as strong treble presence as well. To be specific, the earbuds include 5mm bass driver and 8mm treble driver sitting next to each other. Due to use of dual drivers, Avantree D18 size is comparatively bigger than other earbuds and might cause a problem with people who have small ears. 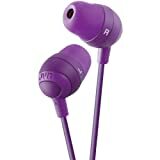 However they offer excellent sound in exchange and that too at an affordable price. Avantree D18 comes with an inline microphone with metal housing as well as braided cable. It offers frequency range between 20Hz-20kHz and impedance of 16 Ohms. The package includes Avantree D18 Earbuds along with couple of eartips and rigid carrying pouch. 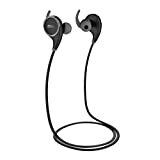 These are reliable earbud when it comes to running, jogging and sports as well. Since they come with an around the ear design, you don’t have to worry about them falling out during extreme exercises. "All in all, the Avantree D18 Dual Driver is an excellently packaged earbud that can compete with other in ear headphones double its price. Though the build may be average however they stand high when it comes with sound quality." You might be surprised by seeing Panasonic’s name in our list of Best Earbuds under $30... as the brand doesn’t have a good number earphones under its name. However mark Panasonic TCM 125 as an exception... as the entire audio industry is going gaga over how great these cheap in ear monitors sound. Even these are #1, top selling and best Sound Isolating headphones on Amazon.com for a very long time. They have 2,100+ customer reviews and have 4.4/5 stars. Headset packaging is cheap and you can’t expect anything more than that since they cost less than $11 and also feature an inline microphone. Just like the previously mentioned Sony MDR XB450AP, the Panasonic TCM125 too have an angled earplugs which feature 9mm drivers inside. The inline microphone has only one button that can be used to receive/end calls and play/pause music. Don’t expect crystal clear audio quality via the microphone... just decent performance. However when it comes to sound that comes off these earbuds... you just can’t complain. "Let me get this straight: These are not the best looking, best built and durable cheap in ear monitors out there. However the reason I’ve featured them in my list of Best Earbuds under $30 is because they produce excellent sound over all kind of genres." In almost all the list related to headphones I’ve created... I usually tend to feature headphones/earbuds from MEElectronics brand. 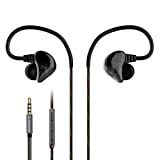 The company has been generous enough to provide great sound earbuds at cheaper price. This time they’ve successfully been to able to provide wireless and Best Earbuds under $30. MEElectronics AF18 have a small and very sleek design weighing only 3 ounces, making them very light and easy to use. Specifications wise they feature Bluetooth 4.1 version along with support for AptX that allows you to enjoy high quality and skip free music, even the sound quality feels like just any wired earbud. For price of $30 you get a cheap but good earbuds that fit well and sound great. 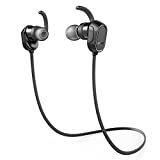 These too have angled design with earfins that feature Locked-in fit functionality allowing them to stay in place when you take them outdoors, while running or during gym sessions. To add more to this amazement, the company also has included microphone module inside the earplugs itself with noise-and-echo cancelling technology. This saves space on the earbuds wire and makes them look sleeker. "If you have sporting needs and require the Best Earbuds under $30 to compliment it... you know where to look now." …and these Bluetooth Sport-based in-ear headphones from the brand are an excellent addition to its arsenal. For the price, Anker Soundbud Sport comes in an excellently packaged box; it contains the earbuds itself along with two extra pair of ear stabilizers, a micro-USB cable, a couple of extra eartips, carrying pouch and user manual. Talking about the product’s design, there’s nothing fancy, and I’m glad about it. Its design is practical and will be an ideal fit for day to day use, and since they’re lightweight as well; you won’t be able to notice their weight during intense workout, without the fear of them falling out. Since they’re Bluetooth-based sports earbuds, there’s plenty of going-on inside Anker Soundbuds. Talking about its specifications, it comes with Bluetooth 4.0 technology along with CVC 6.0 Noise Cancelling feature. It has IPX4 certification that means it is splashproof and is sweat resistant as well. It offers 8 hours of battery life on full charge that will last quite a while. Hence by those standards, the earbuds will last up to a week. 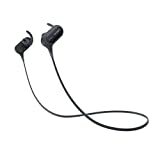 The company lists in its specifications that the Soundbuds Sport offers high-fidelity sound, however, that’s not true but comparing to other Bluetooth Earbuds in similar price range, the sound quality is very good. Do feel free to check out its full specifications here. "Anker Soundbuds Sport is an excellent fit earbuds that offers great sound quality at an affordable price and also doubles up as a sports earbuds, making it an ideal companion during your jogging, running and workout sessions." SoundMAGIC may not be a renowned brand compared to other brands mentioned in this list of Best Earbuds under $30. However let me tell you... SoundMAGIC has some of the great and cheap earbuds under its name and there are people who totally swear by this Chinese Audio brand (count me in too). I’ve personally owned the SoundMAGIC ES18 for over a year and half, and just lost them recently... hence had to go for a new pair. This are one of the lighest and cheap in ear monitors you’ll ever use. For the price, the package looks good and the company is generous enough to throw in a pleather draw string carrying pouch along with two more sizes of eartips... however I would have loved if the company could have also thrown in a shirt clip too. I think I’m asking more for the price SoundMAGIC ES18 sits at. The wires have rubberized finish and feel good, the earplugs have plastic built and don’t feel durable when you first touch it... however the one I used went without any hiccup for almost 6months... till the earplugs came in half. However applying some glue, I was able to get them back... the glue later added some weight to it and also dampened the sound... this resulted in a much better sound quality later. "You definitely can’t go wrong with SoundMAGIC, if you want the best earbuds under $30 that plays all kind of genres with ease. You also don’t feel their weight and keep enjoying your music. SoundMAGIC ES18 has the perfect balance between bass and treble, even the mids packs ton of punch. Be ready to shell your $15 on this one." #1. Brand: Usually I don’t include this point when choosing headphones over $100, however when it comes to cheap but good earbuds under $30... the band is already filled with tons of cheap stakes. Hence make sure, the brand of earbuds you’re choosing has some reviews on the Internet, Youtube, has their own website... moreover if it has Wikipedia page of their own... then you can be very well rest assured. #2. Type of Earbud: If you’re searching for the Best Earbuds under $30, you’ll find a lot variety meant for various purposes. Some are just simple noise isolating in ear headphones, some are meant for gym use, some of them have ear hook design, some of them are wireless Bluetooth headsets. #3. Inline Microphone: I personally don’t prefer earbuds with inline microphone as I do feel the weight of microphone and it makes the left earplug slight heavier. Even the quality of such microphone is just average making the other person have hard time listening your voice. Most people wouldn’t buy the Best of the Best Earbuds under $30 that I recommend them if it doesn’t have inline microphone. That’s how important it is to some people, if you’re one of them... search with the inline microphone filter on.